ZBrush gives you many different methods by which to create a base mesh that can then be used as the starting point of your 3D illustration. You’ll find that some methods will be better than others, depending on your needs. QuickMesh and ZModeler : Start from a simple QCube, QSphere or QCylinder and build any shape you want using the powerful ZModeler. Polymeshes : ZBrush can import 3D models from other applications, using either the .obj or .ma file format. Alternatively, you can use GoZ to bring your models into ZBrush from another application. Primitives : ZBrush includes several parametric primitives which, when combined with masking and initializing options, allow you to create thousands of different shapes. Shadowbox : This tool creates a SubTool from its shadow projection. Paint shadows on 3 different planes to freely construct objects, which will appear in the center of the box. 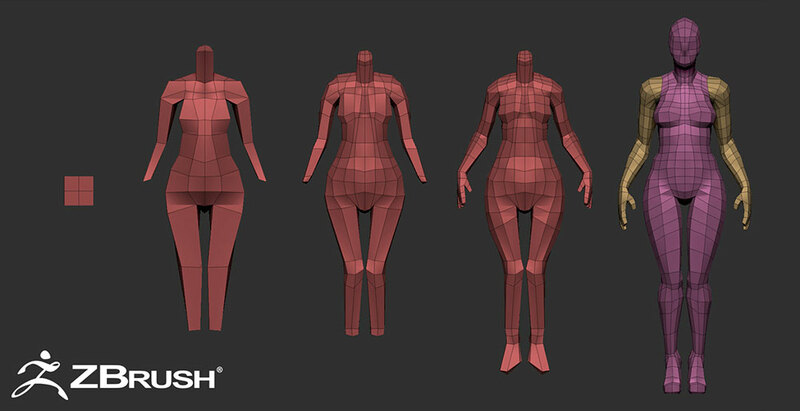 Mesh Extract : Paint a Mask on a model and ZBrush will extract from it a new SubTool complete with definable thickness, based on the topology of the original mesh. Remeshing : Combine different SubTools together mixed with Add, Subtract and Intersection operators to create a new object. DynaMesh : A perfect solution for free-form sculpting because it removes all need for focusing on topological constraints. ZSpheres : This special object generator lets you create structured models. It uses the Adaptive Skin feature, an advanced algorithm that creates a skin of polygons around these ZSpheres structures. ZSketch : This is a variation of ZSpheres that allows you freely create your models by sketching volume onto an existing ZSphere armature. Mannequins : Essentially ZSphere armatures, mannequins are poseable figures that allow you to set up a scene without doing any sculpting.